I'm finally getting around to reviewing one of my favorite gel pens that I've ever used - the Pilot Juice in 0.5 mm. Overall, I quite like this pen; I don't have too many gripes with it. In fact, after getting a couple from Tokyo Pen Shop back in June, I even got a 24-pack when I was in China - that's how I much I like them. In fact, I'm almost completely done with my black Pilot Juice that I've only had for quite a short amount of time. Of course, however, this is all a matter of opinion, and not everyone would agree with me on this matter. 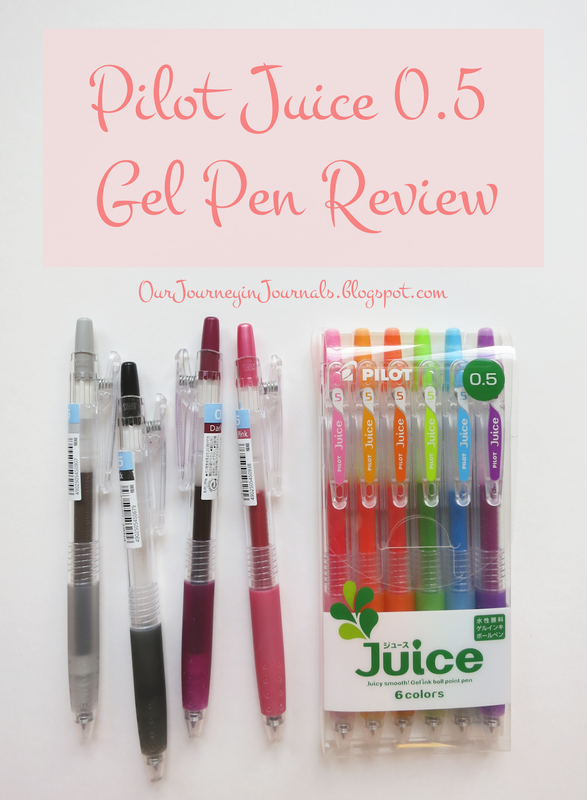 But I digress; for a more in-depth review of the Pilot Juice gel pens, keep on reading! First, let's start with the aesthetics and physical appearance of the Pilot Juice. Most of the design is pretty basic and standard: a completely translucent plastic barrel, a semi-transparent rubber grip with a couple of rows of decorative dots, and a retractable, conical point. The grip, clip, and clicker (plunger, I think it's called?) all match the color of the ink. 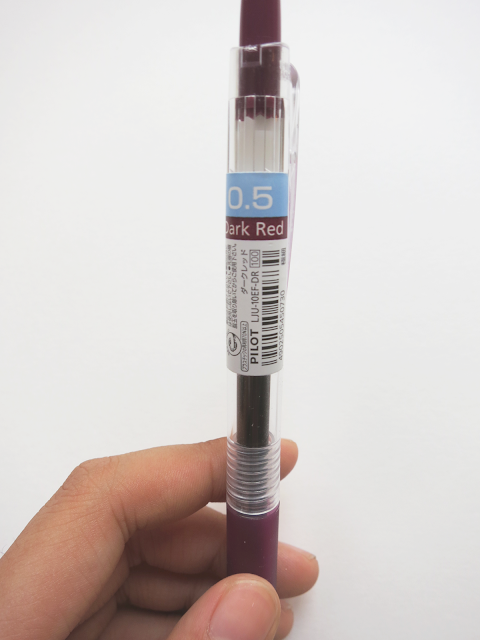 Because the rubber of the grip is somewhat see-through, you can see the ink level even when it's low and below the plastic of the barrel. I also find the grip to be pretty comfortable; it seems to be smaller and a bit cushier than the grips of most pens, so if you have big hands, the Pilot Juice probably won't be good for writing for large stretches of time. However, for someone like me with smaller hands, it's a relatively comfortable pen. If you're like me and like to take pens apart, you would discover that the spring of the pen is actually attached to the inside of the pen. This isn't really important, but I like bouncing the ink cartridge of the Juice if you take the barrel off. You can also make the cartridge fly out completely. The clip is a unique feature of the Pilot Juice Gel Pens; it has a hole to loop a chain through it or something, and it's spring-loaded, meaning you can easily clip it onto a small or large stack of papers, and it wouldn't fall off either way. It's also really fun to play with when you're bored. However, I need to note that the top of the pen sticks up pretty far when clipped onto something, though this isn't something that bothers me at all. The label is pretty great, as far as labels go. Along with some Japanese that I can't read, it also states the tip size (color-coded and in large print) and the color's name in English. 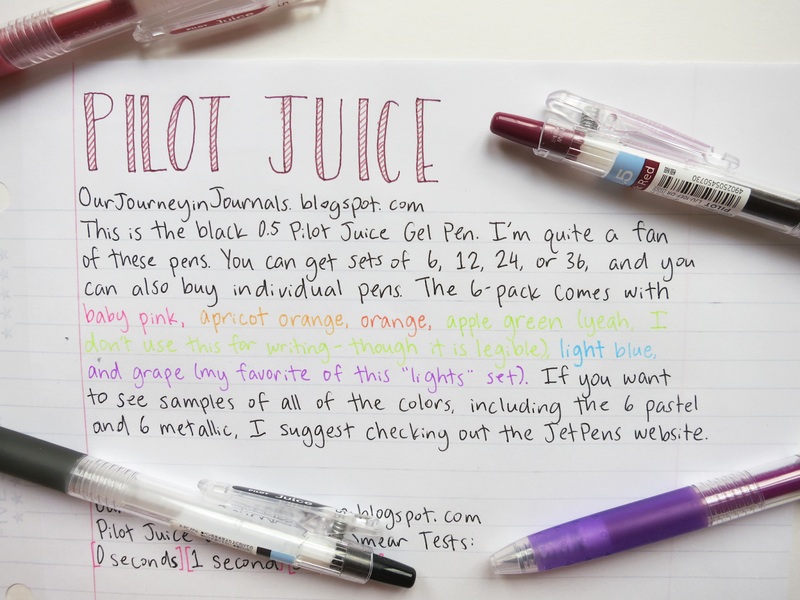 I find that this is a really helpful feature, especially considering that there are 36 colors in the Pilot Juice range in total. To the best of my knowledge, there are three different tip sizes offered: 0.38 mm, 0.5 mm, and 0.7 mm. The 24 normal colors are available for all of them, and the six pastel and six metallic colors are available only in 0.5. I have all 24 of the normal colors plus one metallic. As you can tell, the color selection is great; I especially love the dark red color. I only wish there were more purples, but I'm just a purply type of person. If you want to see a writing sample of all the sizes, click here to go to the JetPens pictures. As far as availability and price go, the Pilot Juice fares mediocre-ly. In Asia, you would be able to find them in most good stationery shops, but here in the US, they aren't in any physical stores. 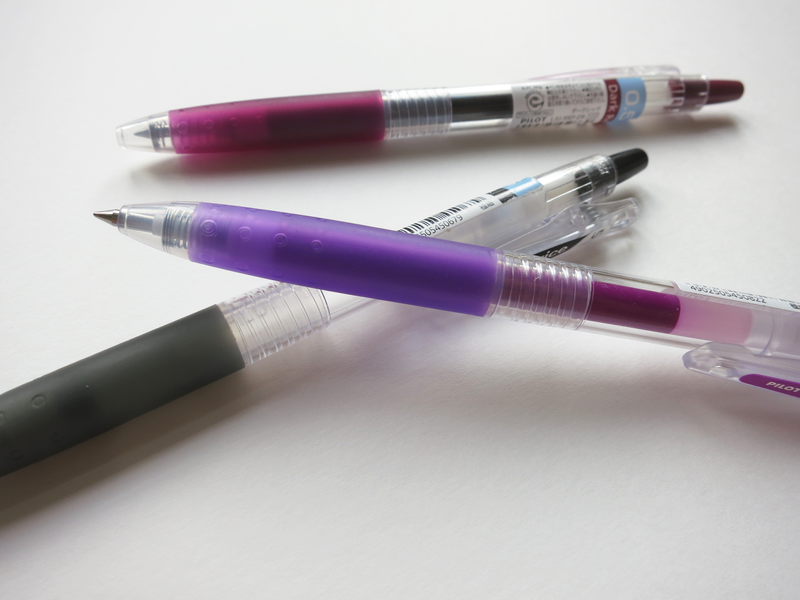 You can find them online at many online distributors (like JetPens, Tokyo Pen Shop, and Amazon). 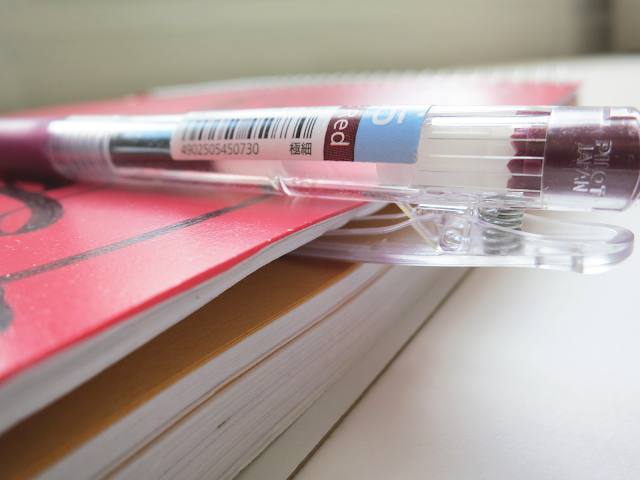 The price of these pens is really good for non-sucky gel pens; they're generally $1.65 per individual pen, and a pack of 12 can range from about $12-$20. They're also kind of refillable; there are cartridges available for black, blue, and red (but Pilot G2 refills also fit). 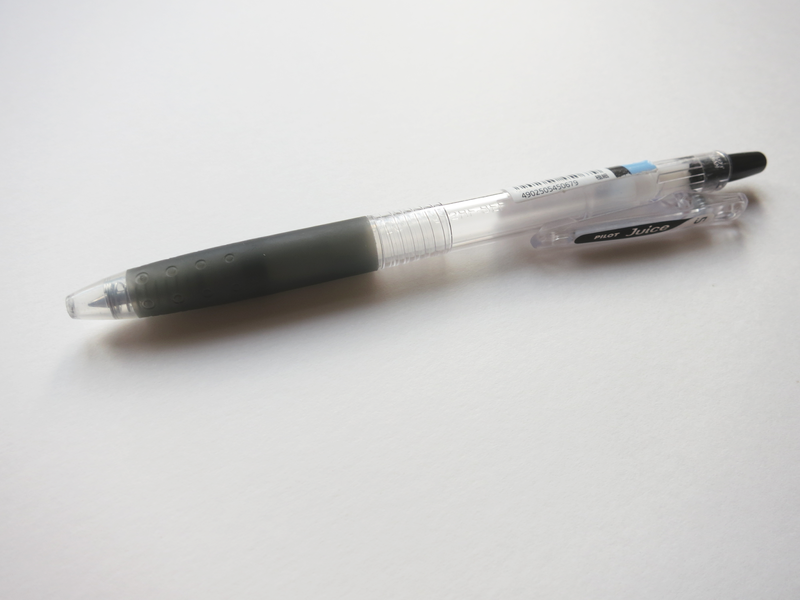 Now for (arguably) the most important of a pen: how it writes. Overall, I'm pretty happy with these Pilot Juices. They are really smooth (I hardly get any sort of skipping). However, railroading is a bit of a prevalent issue. It's not a problem when I'm just writing just a couple of words or on higher quality paper (like my new Rhodia Webnotebook), but when I'm taking fast, extensive notes in a cheap notebook, railroading tends to be somewhat inevitable unless I write with an uncomfortably light touch. It happens more often with lighter colors, though I've learned somewhere that this is the nature of lighter inks because particles of white pigment are larger than the particles of black pigment. In my opinion, however, it doesn't railroad that much (i.e. the railroading that does end up happening isn't very severe), so it doesn't make the feel of the writing itself annoying nor uncomfortable. 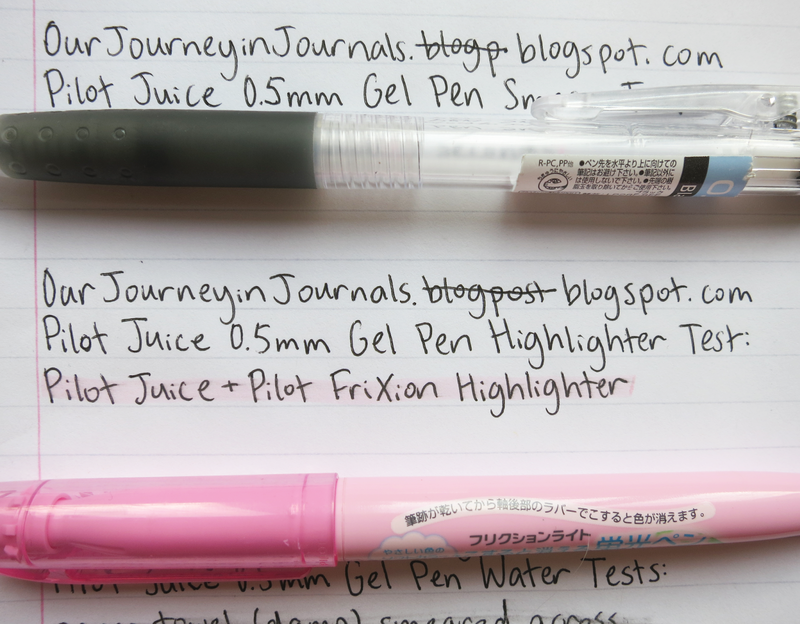 Regardless of how wet each of the different colors writes, the ink of the Pilot Juice Gel Pens is kind of translucent (but not necessarily in a bad way). It's more noticeable for the colored ones, but I don't think you can tell as much for the black ink unless you're actively comparing it to another one. 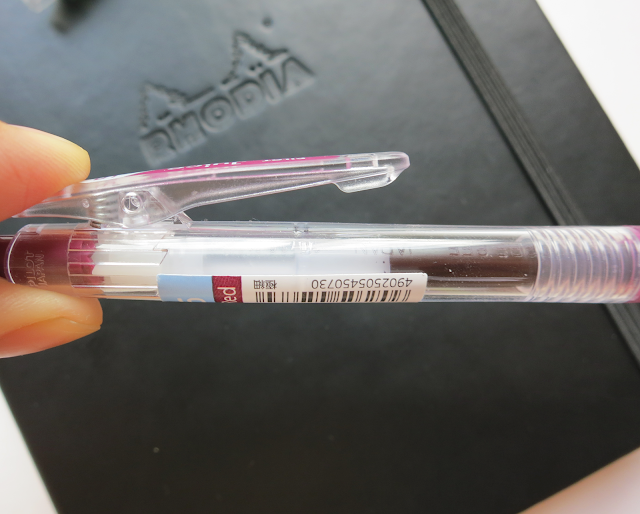 This is actually cool, though, because it can make it look like you're using a shaded fountain pen ink. I'm assuming that this probably correlates to the transparency of the ink and its tendency to railroad, but the pen is also not very inky. It's actually a good thing, though - it means that there is almost no smearing and absolutely zero bleeding (pretty much no matter what paper you're using), as you can see from the picture of my super scientific smear test above. This is awesome, since the way I write (even though I'm right-handed) often smears the still-wet ink. 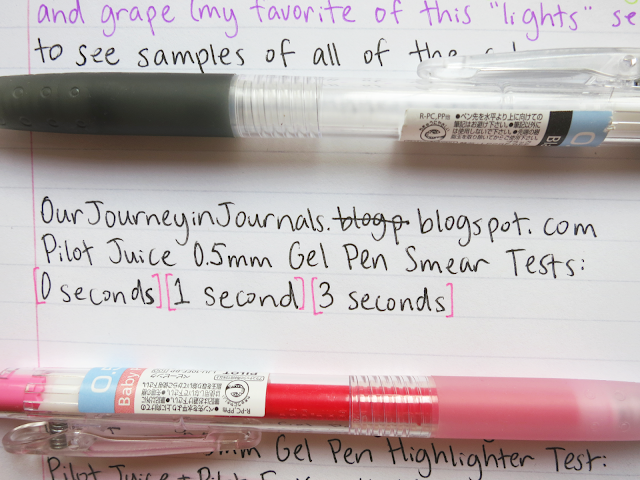 In this highlighter test, I waited 30 seconds before highlighting using a pink Pilot FriXion Light and Soft Highlighter that I got while I was in China. 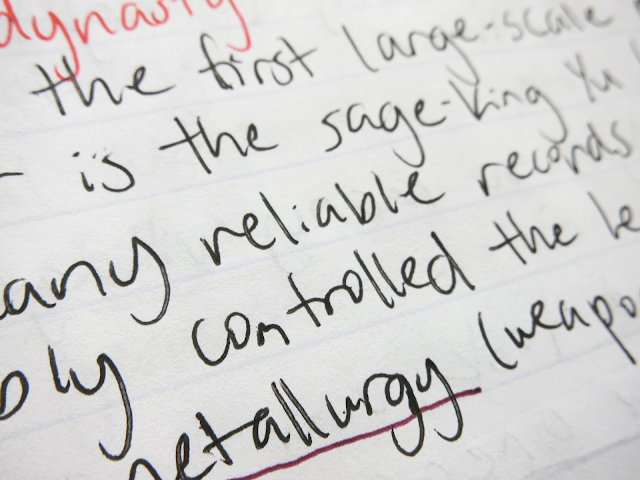 The Pilot Juice Gel Pens did fairly well for a gel pen, but that doesn't mean that it necessarily was a "good" result in the grand scope of things. 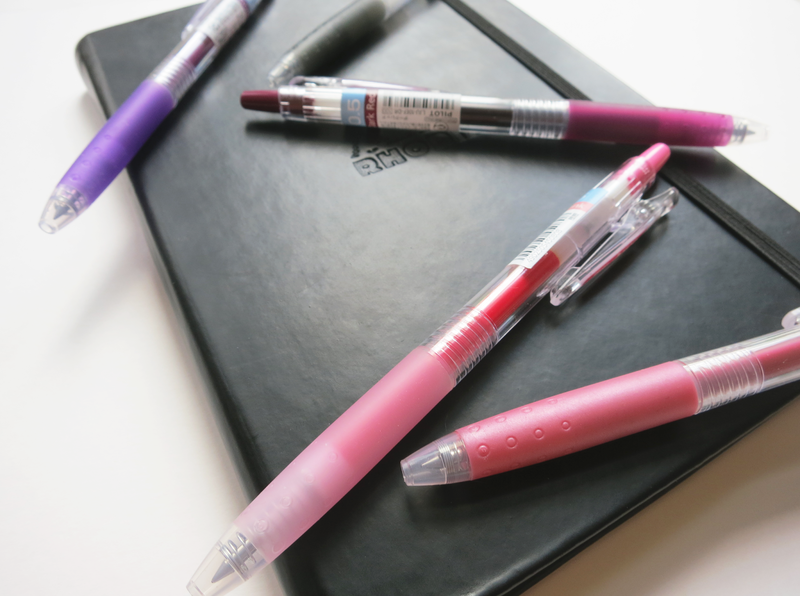 Since these pens are pigment-based, they're supposed to be water-resistant and fade-resistant. Of course, I can't really test fade-resistance, and only time can tell. However, I did indeed test the water-resistance, and I have learned that the definition of this said resistance is quite lenient. 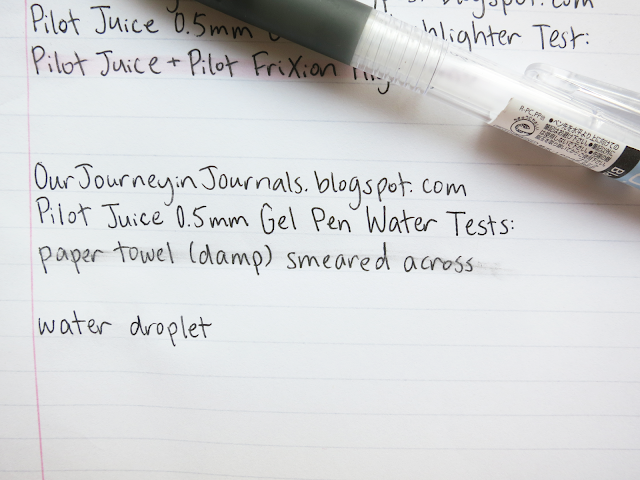 As you can tell from the results of my water tests above, the Pilot Juice was not affected when I squeezed a drop of water on top of the writing (after it dried, of course), but when I scrubbed a damp paper towel across the words, it smeared. In general, I really like the Pilot Juice Gel Pens, and as of now, I would say that they are overall my current favorite gel pens. I'm not a fan of its inclination to railroad, but I especially enjoy the relative cheapness, its comfortableness, the abundance of colors, and the quick-drying properties of the ink. I would rate it an 8.5/10. I hope this was helpful in your endeavor to buy all of the worthy pens in the world, and feel free to leave a comment with any questions or comments about the Pilot Juice! What's your current favorite pen?